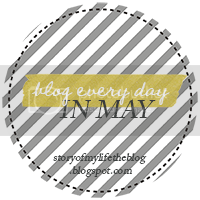 Welcome to my "Blog Every Day in May Challenge" that I am participating in going on over at Jenni's Story of My Life. Go see the list HERE for the whole month. Disclaimer: I know it is not May anymore, but I only got half way through the month and want to finish with these topics. Day 16 for Thursday, May 16th: Something difficult about your "lot in life" and how you're working to overcome it. I know this may sound sorta cliche, but I don't think I have a so called "lot in life." Certainly I have had things happen in my life that have changed me or my perspective on life. The miscarriage I had back in the summer of 2010. All my experiences have made me who I am today, but I wouldn't say it's my "lot in life." I love my life and feel that I am very lucky and fortunate to have it. I say my prayers every night with Hailey and we talk to God about all our blessings. I wouldn't change it for anything. I'm not sure I knew any of those things about you, Leah! thank you for sharing, and I'm so sorry to hear about that. :( You seem to have a really positive attitude about it, though!